The Aladdins’s Wishes is a 5-reels, 20 paylines slot with a theme based on Disney’s Aladdin movie. If you grew up watching this the romantic fairytale and laughed and cried with Aladdin, his Genie and the magic carpet, then this is the free slot for you. You will get the magic wishes from you loyal genie. It is the classic tale of Aladdin that makes you feel like you are in the real story. This real-time gaming slot game brings Aladdin and his genie to life. It comes complete with a progressive jackpot, scatter, wild and bonus features. 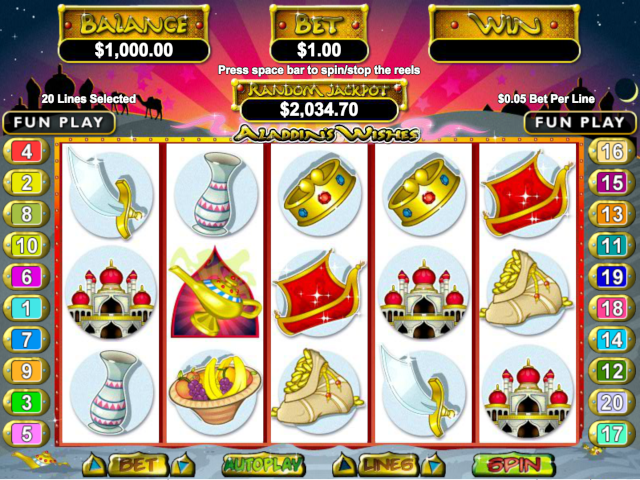 The progressive jackpot is awarded at random after any standard game. You don’t need to play at maximum bet to trigger this jackpot and the highest win is 50,000x total bet. Across the world, the story of Aladdin has been told for many ages. It is one of the most familiar tales in and narratives. It is a classic tale of rags to riches, featuring a young hero who must learn a vital lesson. There is an exotic setting, magic, a heroine, and an evil villain. But there is much to this story than what most people know it to be. Once you enter the slot for Aladdin’s wishes, you enter a world of enchantment and fantasy full of magical lamps. You will encounter the Aladdin, the genie, the princes, the magic lamp, the magic carpet, the monkey, and the Arabian sword. Many features and symbols make the game a reality. Every setting that is in the Aladdin narrative is without a doubt represented here. Any symbol that is reminiscent in the classic tale is represented here. You will meet Aladdin first with his faithful sidekick the monkey as well as his loyal genie. Then there is the beautiful princess with the magic lamp, the faithful magic carpet and lets not forget the Arabian swords. Aladdin is the wild symbol. He alone can substitute for all the other symbols on the reel to finish combinations and payouts that are not yet complete. The magic lamp is the scatter – which can unlock the bonus Aladin’s Wishes Feature. When 3 or more magic lamp land appear anywhere in the reels, Aladdin’s Wishes feature is triggered. Once triggered, the player can choose from 5 magic lamps that appear. Each scatter awarded during the spin that triggered the feature will earn the player a pick at one of the 5 magic lamps. The highest award from these lamps is 25 free spins, the other prizes include 2, 5, 10, 25 or 100 times the triggering bet.